In 2015, there were roughly 10.4 million patient visits to doctors' offices because of common knee injuries such as fractures, dislocations, sprains, and ligament tears. It is one of the most common problems affecting the muscles and joints of the body after back and neck pain, and is the most common site of pain and disability in the upper and lower pain and disability in the upper and lower limbs. The knee is often one of the most problematic areas of the body, whether you're focused on long distance running, sports that require plenty of cutting and sharp lateral movement, heavy lifting, or any activity that's hard on the legs. The wellbeing of your knees and the muscles around them are an essential part of your fitness goals, even if keeping them strong and supple isn't necessarily part of your program. Even people who are not involved in heavy fitness activities can develop knee pain. The truth is that if you've never felt any kind of knee pain whatsoever, the chances are good that as you grow older, you will. Our bodies tend to lose muscle and bone mass as we age, and we become more susceptible to the aches and pains that may result. When we injure the knee in some way, it naturally stops working as it should. It won't bend fully or pull quite as forcefully. That makes it hard to pick something up from the floor or pull something down from overhead. Spending hours in front of the computer becomes torture. Lifting groceries out of the car and carrying them into the house becomes an ordeal. New grandparents can't stand up comfortably to hold the baby. But neither the weakness nor the pain is inevitable. The knee can be fixed, and the pain can go away. First, there's a systematic way to cure the weakness and ends the pain. But there's also a way to prevent problems to begin with, so that you never have to lose the strength, stability, and range of motion of the knee at all. 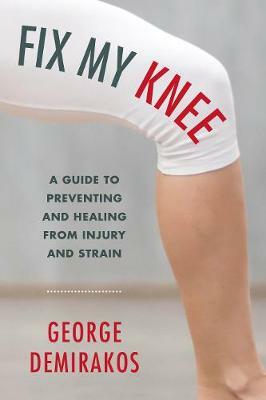 In Fix My Knee, George Demirakos shows readers how to do both. For anyone with knees, this book will show you how to keep them healthy and strong, and what to do when things go wrong.